One of my Facebook friends recently posted a notice saying: “Don’t be afraid to have an open mind. Your brain will not fall out.” I chuckled, and then I thought about some of my sourpuss closed-minded friends. I guess they never worried about losing their brains (although one older friend worries about going senile like her father). I’m convinced, in fact, that the sourpuss friends’ brains are shrinking like dried-up raisins. More troublesome and frustrating, however, is the fact that their negative and grouchy outlook displays a short supply of Christian joy, generosity, and tolerance. Being open-minded can be tough sometimes. It shakes a person loose from beliefs and values once so comforting. It enables a person to appreciate that beliefs and values are temporary and provisional stages along life’s journey. We learn new things; adjust our vision and beliefs; and we re-shape our values as we go along life’s road. The journey always leads, I believe, to sunrise at the horizon. I remain the perennial optimist. But we do indeed change…. Yes of course, there are indeed some fine younger and older people in holy orders. They deserve our appreciation and even more our moral support. Their’s is not an easy life these days…. The grumpy ordained ones, especially hierarchical types, seem to be making most of the noise these days, however. They are circling their wagons, as they continue to condemn and complain about issues most people have moved well beyond in their own life journeys. Can a genuinely Christian father or mother, for instance, really look at a gay son or lesbian daughter and still believe their much-loved children are locked in an “intrinsically evil” condition! I remember as well a now deceased cardinal who, with tears in his eyes, approved an abortion for his university student niece who was drugged and raped. “It wasn’t her fault” he said….. Examples abound. But now we come to the benefits of being an open-minded believer. There are seven just like the seven sacraments….or the seven capital sins…..if you belong to the grumpy group. (2) Experiencing personal changes. Opening up our minds to new ideas allows us the opportunity to change what we think as well as our view of the world. This doesn’t mean one will necessarily change basic beliefs. It does give one the option to adjust beliefs, when one begins to think with a more open mind. I once thought it impossible for women to be ordained. I once thought Jesus’ disciples were all guys. Now I know that both beliefs/understandings are pure nonsense. (3) Making oneself vulnerable. This is more scary. In agreeing to have an open-minded view of the world, we acknowledge we don’t know everything; and we accept that there are possibilities we may not have considered. This vulnerability can be both terrifying and exhilarating. The jar is half full or half empty. It depends on one’s perspective. (4) Making mistakes. With an open mind one begins to see things from others’ perspectives; and one can recognize the mistakes one has made. From time to time, we all fail and fall. The challenge is to acknowledge it and then get back up again and continue the journey. That is the virtue of Christian humility and courage! (5) Strengthening oneself. Open-mindedness presents a platform upon which a person can build, putting one idea on top of another. 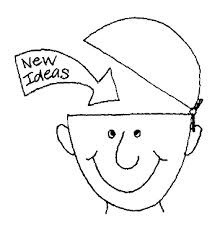 With an open mind, one learns about new things; and one uses new ideas to build on old ideas. In my field we call this ongoing theological development. Dangerous stuff for the old guard at the Vatican! Nevertheless, everything a woman or a man or a child experiences adds up. It strengthens who one is and what one believes. Note well: It’s very hard to build on experiences without having an open mind. (6) Gaining confidence. When a person really lives with an open mind, he or she develops a strong sense of self. One can respect and appreciate, but is no longer confined by, the beliefs of others. Then the respectful dialogue can and should begin…. (7) Self honesty. Being open-minded means admitting that one is not all-knowing. Even if one is a bishop or a pope….or an old theologian! Whatever “truth” one holds, each person must realize that the underlying reality in its depth has more to it than anyone realizes. This understanding creates a sense of honesty that characterizes anyone who lives with an open mind. Nicely done, Jack! I find it fascinating that those with closed minds seem to have a remarkable ability to resist being confused by the facts!